Miriam Bajtala deals in her work with perception and the parameters that define and alter it, such as space, time, and context. 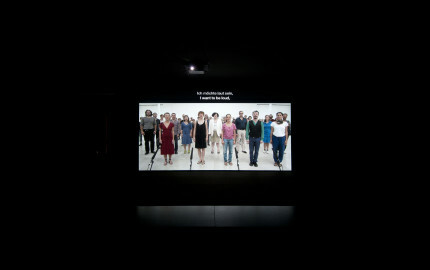 Her repertoire includes videos, drawings, and sculptures, as well as text-based works and performative installations. In recent works, like the video 3 Stimmen (three voices, 2011) and the performances 2 Monologe für einen Chor (2 monologs for a chorus, 2011) and die Rede (the speech, 2012), Bajtala examines the linguistic articulation of (self-) empowerment, representation and communication. Speech, written text, vocal variations, losing and claiming language are both the objects and means of her artistic analysis. An official speech is subject to certain conventions and formal rules that help to lend significance to its subject—an artistic work and its author—and to address or represent it accordingly. Taking this as her point of departure, Bajtala deals with the act of speaking about artistic work that is usually left to experts such as curators, critics, theorists, self-reflexively re-appropriating this discussion of the work. For her contribution to the Kabinenschau exhibition, for example, Bajtala wrote a speech and employed an actress to deliver it at the exhibition opening in her place. 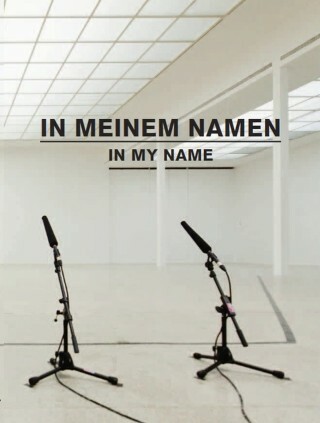 With in my name (in meinem Namen, 2013), the work she conceived and realized for her exhibition at the Secession, Bajtala addresses the theme of the speech and associated questions of representation. In this work, she questions her role as an artist by juxtaposing her self-perception with the views of four cultural producers. She commissioned a woman artist, two curators (one man, one woman) and a woman writer to write a speech in her name, speaking on her behalf about her work. 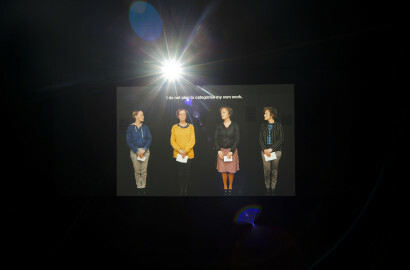 In the video four speeches (vier Reden), the artist portrays herself at the same time as representing her four authorized representatives in their various roles. 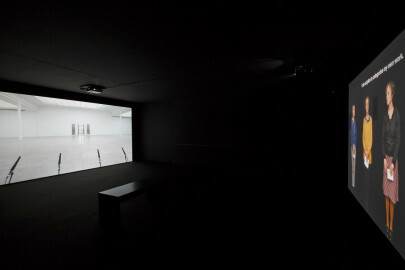 Against a neutral black background, the artist is seen four times in close-up, sometimes speaking directly into the camera, sometimes as a voice-off or a whisper. Bajtala’s own speech, written in response to the four commissioned speeches, was staged last year in an entirely different way: here, she had herself represented by a chorus, a group of people who responded to her call to participate in an art action by reciting a text together. 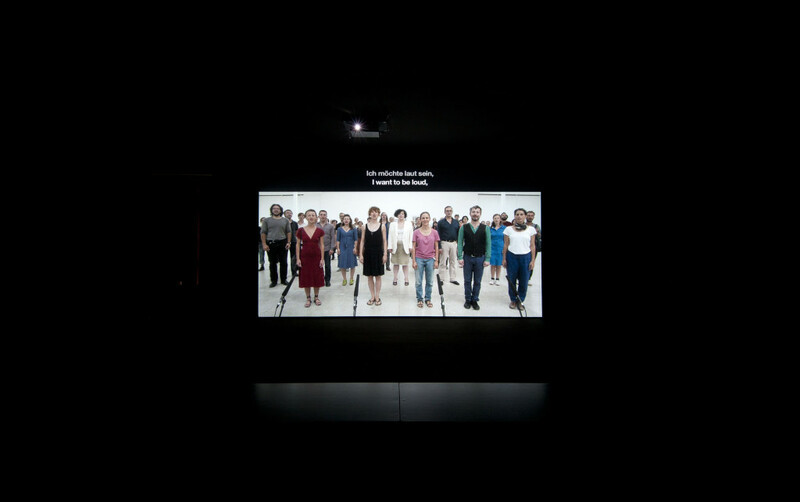 The video Chorus (Chor) shows the group entering the Secession’s Hauptraum—the size of the group called for a large space—taking up positions and then reciting Bajtala’s speech. Logically enough, the speech begins with the words: “I would like to be loud.” Surtitles help the audience to follow the text—as in the case of (foreign language) operas. In the installation, the video works Chorus (Chor) and four speeces (vier Reden) are projected on facing walls, screened alternately. The changes of perspective—from close-up in four speeces to the long shot in Chorus—is also to be understood in spatial terms. 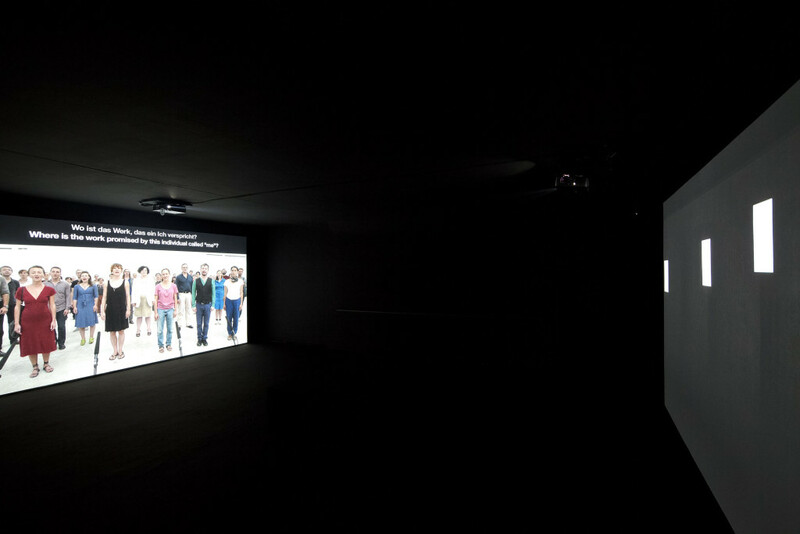 The Hauptraum, a space many times larger, is literally projected into the Grafische Kabinett that has been transformed into a black box. With this spatial merging, Bajtala raises the question of the specific characteristics and representational character of the space: the sublime quality of the white cube is confronted with the intimacy of the Grafisches Kabinett. Miriam Bajtala, born in Bratislava in 1970, lives and works in Vienna.